JayWalk - All Your Xmms Are Belong To Me: Do You See Where The Problem Really Is? These days complains about our mobile network are a dime a dozen. You hear one every other day. We have only 3 Mobile Telcos to our name and yet not a single one was spared from someone's wrath at any one time. So the question is, if this one no good, that one bad and the third one is pathetic? Where do we go from there? Are our telcos so bad or is there another underlying reason explaining all these? Let's pause for a moment here while I jump to another topic before tying everything up together. Then you will see where I am heading with this. This is a picture familiar to all those in Singapore. 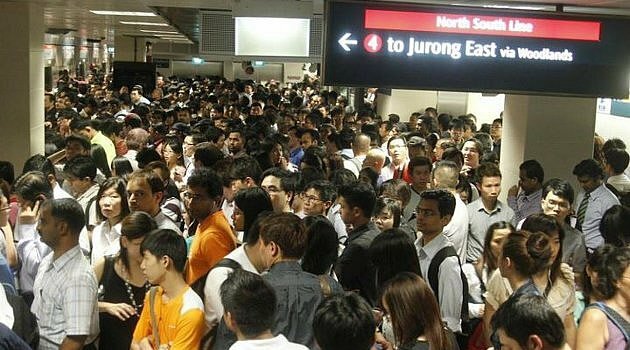 Everyone must have seen this particular picture at one point in time or another as it was widely circulated in cyberspace when the Circle Line of the SMRT was just launched. This was a scene at one of the MRT station when the train broke down. It wasn't a one-off incident but it seems to be happening every other day now. You don't need to be a rocket scientist to see the link between the two MRT pictures above. So. To tie up everything as mentioned earlier. I do not think that any of our mobile telcos themselves are that bad except for spotty coverage and the odd system crash in certain parts of the island. I do not think that our SMRT train system itself is that bad except for hints of cutting corners at the expense of proper maintenance. I see the real problem is capacity inadequacy. Our SMRT train system and mobile telcos simply aren't geared to undertake our present load of usage. You may blast them for their failure to plan ahead but seriously let me ask you this. How many of you actually expected our population to explode at such a ridiculous rate 10 years ago? 20 years ago? Perhaps it was info privy only to a certain white pants club but to the rest of us, I don't think anyone foresee it. Yes, we need population replenishment from the outside given that our total fertility rate was a pathetic 1.15. But the open the flood gates like a cheap aging prostitute is just plain stupid. Just because you missed your breakfast and lunch, doesn't mean you have to eat 3 portions at dinner. Yes, you would probably eat more than you would compared to a normal dinner but certainly not 3 times the regular portion. * Simple straight line calculation. Hint: It is not the mobile telcos or SMRT for their respective failures to plan ahead (except for a few misgivings here and there). yay,, finaly someone sees the problem. The way I see it, I feel all these telcos and SMRT all kena sabo. Indeed, now that housing is getting more and more expensive. the problem is...not my problem. YunZ: Perhaps it is not your problem directly but everyone is affected one way or another.